This weekend I want to attempt another Westerns marathon. Since Westerns are not what I would call a favorite genre of mine I had a bit of difficulty sticking with it on my last attempt. But Westerns has grown on me some... so I wanted to see if I could do better with it this time. Last time I enjoyed the movie serial (The Painted Stallion) I watched in between movies just as much... if not more then the movies themselves. So I am going to do something similar this time as well. 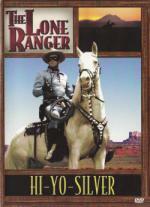 Since I don't have another Western serial I am going to watch episodes of The Lone Ranger in between the movies. I really increased my collection of Westerns here recently when I bought a cheap 20 boxset. I hope to get at least a few of those movies watched even though I am not expecting much at all from them... especially quality wise. Here is my list of Westerns... titles in Bold are ones I never seen before. So if there is any requests for a review... let me know and I will try to fit it in. And yes I know there is at least a couple people here that wants to see what I think of Open Range. According to the box Between God, The Devil and a Winchester stars Gilbert Roland and Richard Harrison... and nope... I am not familiar with either of them. And yes it is a European movie... Italian. Or I guess you would say a Spaghetti Western. Tombstone is definitely one I would like to see! But nope... don't have that one yet. So if there is any requests for a review... let me know and I will try to fit it in. Well, I've heard of Gilbert Roland...I do remember that from your previous listing. Try not to watch too many of those European westerns in a row...try to space them out a bit in your viewing so you don't burn out on that kind of film. If you'll recall, in my review I didn't care for Forty Guns that much...but another member here came back and said he loved it. So maybe you'll be the deciding vote whenever you decide to watch that one! Lee Powell is the legendary Lone Ranger in this 1940 feature version of the 1938 Republic serial, which marked the masked lawman's first live-action appearance after starring in a radio serial and a comic strip. 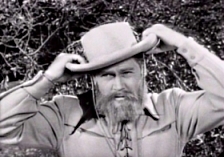 Powell plays one of the five men who may be the Ranger, and who die one by one while the villains try to figure out which of the men survived the massacre and was nursed back to health by Tonto (Chief Thunder-Cloud). 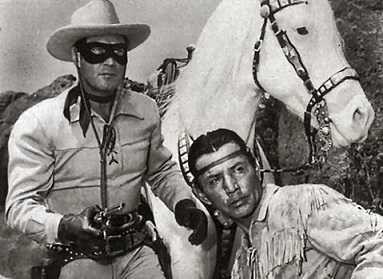 Among the most famous serials in history, this was directed by acknowledged chapterplay champions William Whitney and John English, and spawned a sequel, The Lone Ranger Rides Again, the following year. I have been a fan of The Lone Ranger every since I was a kid and use to watch the old series with Clayton Moore and Jay Silverheels that reran every Saturday afternoon after the Saturday Morning Cartoons. Hi-Yo Silver! is a cut down version of the old movie serial called The Lone Ranger that ran almost 4 and a half hours. Yet this cut down version lasted just over 1 hour. Even though I now know how it ended I would love to find and add the original serial to my collection... so I could see all the action that was cut out. I liked this show a lot... though it did feel a bit odd to see The Lone Ranger is a full face mask instead of the mask we are familiar with from the TV Series. I also wish they didn't use an image from the TV Series for the DVD case. I liked how while watching this even you were not sure who The Lone Ranger was till the end of the movie. And not only that... but they gave you the possibility of five different people that it could have been... which made it fun to keep guessing at who he really was. Being such an old show... and considering I have a cheap public domain version of the movie from GoodTime DVD I was expecting very bad quality... but I was actually pleasantly surprised. Sure... it was far from perfect... but it did not look bad at all. Very watchable in fact. There was only one or two very small parts where the video was bad... and the audio sounded very good through-out the entire movie. But of course there is unfortunately no extras on the DVD. This episode of The Lone Ranger guest stars DeForest Kelley... who later played Dr. "Bones" McCoy on Star Trek. I enjoyed this episode. I liked that you get to see The Lone Ranger in a different disguise then you normally see him in... as you can see in the image I used above. Good story... good action. Kevin Costner plays the most famous lawman ever to stride the Wild West. In a gritty, complex portrayal hailed as a "classic American performance" (Bob Campbell, Newhouse Newspapers), Academy Award® winner* Costner plays the man who became a myth in an epic, action-filled saga directed and co-written by Lawrence Kasdan. Gene Hackman as Wyatt's iron-willed father and Dennis Quaid as Earp's deadly best friend, Doc Holliday, add power to this hard-hitting Western. From Wichita to Dodge City to the O.K. 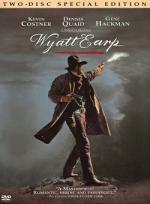 Corral in Tombstone, Arizona, Wyatt Earp is a thrilling journey of romance, adventure and mythic courage. This is one of the MANY Western movies I never seen. But it is also one I have been wanting to see for a while now. I found this to be a very strong (not to mention long) movie. It is a very well made movie that looks stunning. The story is very well told. Of course this is coming from someone not familiar with the story... just going by my enjoyment of the story. And lots of familiar faces. Including one I was surprised to see. That is Mark Harmon (Johnny Behan) who stars in one of my favorite current TV series... NCIS. As long as this movie is... it never failed to hold my attention. Even though the picture on this movie for the most part looked fantastic on my cheap 20in standard TV... it is not without it's problems. most the night scenes (and there were plenty) was a bit too dark... making hard for me to follow everything that was going on. But over all I enjoyed every minute of this movie... and thrilled I now have it in my collection. Including one I was surprised to see. That is Mark Harmon (Johnny Behan) who stars in one of my favorite current TV series... NCIS. Now that is a movie I haven't seen in a LONG time... Unfortunately I don't have that one in my collection to watch. But it is added to my always growing wishlist! Last night I watched the Lawrence Kasdan edition of "The Directors" and Kasdan (the director) talked about this movie some. Apparently, Costner originally envisioned this as a 6-hour mini-series (HBO maybe if my memory serves me right) and he then got Kasdan to come in (they had done Silverado together) and it was redone as a feature film. Kasdan wasn't overall pleased with the film...he felt it was a combination of the two projects that didn't really work. He felt the best part of his film was the Doc Holliday character, played by Dennis Quaid who lost about 40 pounds to play the character. I'll have to watch this soon myself. A nice special edition of this film was released in 2007 and it doesn't cost a lot. Unfortunately I can't buy any more movies this month. Need to tighten the belt a bit this month as it is. dumb?... maybe so... but some of the best comedies are the dumb ones. Wow... can't imagine him thinking Doc Holiday was the best part of this film. Not that he was bad... not in any sense of the word... but I thought the rest of the film was very good as well. Of course what do I know... I am still pretty much a newbie when it comes to Westerns!